Last three days of markets would have drained the productivity of any positional trader in Nifty Futures as the markets rolls in a tight compressed fashion in a narrow 80 point range. Price finds resistance around 10390-10400 levels where most of the short term players are prone to keep their stop levels. Thursdays trading session shows a mid-day emotional sell-off followed by sharp recovery and closed flat for the trading session. The price behavior for this week is in such a way that in the last four trading days it motivates a lot of shorterm sellers than the buyers and yet price inches up like a snail slowly steadily on the higher side. Todays volume in Nifty futures is thin which shows lack of participation. Most traders suspect it could be due to US Market Holidays (Thanksgiving day and Black Friday). Trading Sentiment maintains positive(both profile and indicator sentiment) for the last three consecutive trading session. 10300 puts writers are actively supporting and defending 10300 (on nifty spot) on EOD basis and on the other side 10500 and 10600 call writers are actively writing calls on the higher side which lead to a possible 200-300 point sideways zone till the end of this expiry. And the Market Internals are moderately positive though not aggressively positive. 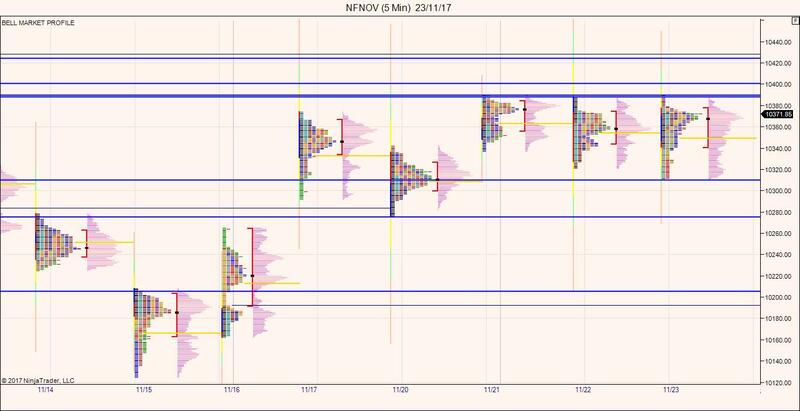 Nifty formed a balanced structure on Thursdays trading session followed. Thursdays trading is completely dominated by short term emotional sellers with possible stops built around 10390-10400 levels. Any price acceptance above 10390 will bring more positive bias towards All time high levels. Markets are likely to show compressed uptrend behavior towards all time high. Probably one of the most boring way of testing all time high.